Madison Dirgo, left, and Kendyl Auddino display the proper application of a tourniquet. SHELTON — For Heidi Aleman, the Echo Hose Ambulance Community Educational Center is a true gift. The center — on the former St. Joseph School campus on Coram Avenue in Shelton — has become home not only for the Echo Hose Ambulance Co. but also numerous programs designed to educate department members and the community. 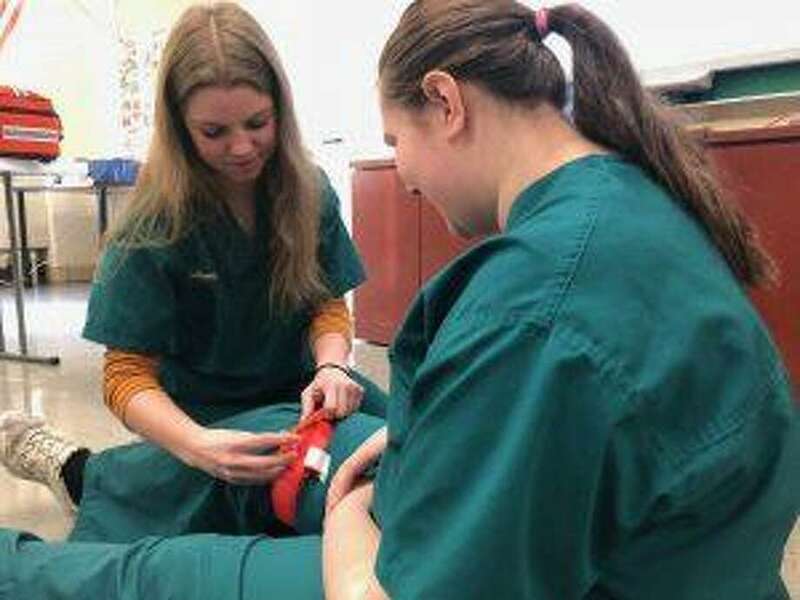 Aleman, the health technology department head at Emmett O’Brien Technical High School, and some 20 10th-graders learned the benefit of having such a facility recently when they attended the Stop the Bleed program, taught by Echo Hose Ambulance Co. members. Aleman said this facility offers the space necessary for intensive training, and the proximity of the Coram Avenue location is key for schools such as Emmett O’Brien Technical School when traveling to the site. Along with Echo Hose Ambulance Co., the building also houses Center Stage Theater and the TEAM, Inc., toy store (see separate article on page 1A). This facility was opened in September with the help of $15,000 grant from the Katharine Matthies Foundation and a donation of furniture and equipment from the R.D. Scinto Co. The center offers training for EMS, fire and police departments throughout the Naugatuck Valley and the rest of the state as well as providing public community trainings, and a place for nonprofits to gather. The Echo Hose Ambulance holds community health education and EMS programs at the center, and adults can take free “hands only” CPR training, bleeding control training, a Narcan administration class, or the Hidden in Plain Sight program for parents looking for signs of underage drinking or drug use. Echo Hose Ambulance is a nonprofit organization that has served Shelton since 1949. Echo Hose Ambulance expects to respond to an estimated 5,100 calls this year, an increase of 8 percent from the previous year. The seven ambulances are staffed 24/7 by 130 volunteers, 30 per-diem staff and five full-time employees. The center is presently used by the Valley United Way; the CARES group holds weekly meetings; TEAM, Inc. has its toy store on site and there are programs being run by the Shelton Youth Service Bureau, Veterans Hospital and BH Health Care. There are also Naugatuck Valley Health District/Medical Reserve Corps, Department of Homeland Security and FEMA funded programs for first responders from all over the state, including Shelton’s police, fire and emergency management services. Echo Hose Ambulance Co. is always seeking new volunteers. For more information, visit ambulance.echohose.org/volunteer-with-us. For more information on the Echo Hose Ambulance Community Educational Center, or to register for classes, visit echohose.com.